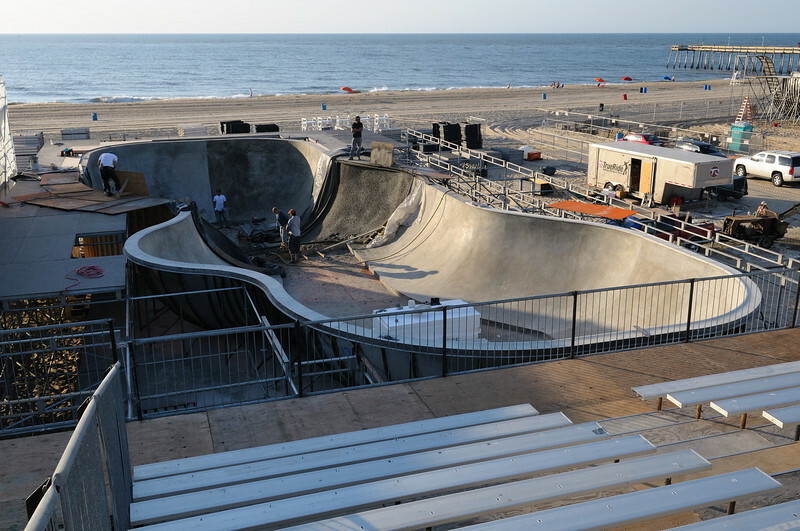 "Dew Tour" set up on the beach in Ocean City Maryland. I will add images as the event progresses. The slide show is a nice way to view them, you can adjust the speed and remove the comments ,if you wish, with your cursor. Very cool. I have set up this free gallery so you may copy (right click) at all sizes. The bowl was designed by Chris Miller and fabricated in California by Spohn Ranch. If you would like to see some cool images of the metal construction go to Concrete Disciples Skateboarding Magazine.....there is a great article there all about this bowl, which is quite unique. Read up and enjoy yourself! Even the "cheap" seats at the bleacher top are gonna be great!